The Ottoman Garden, which opened in August 2006 east of the historic Linnean House conservatory, is a unique quarter-acre walled garden that makes public and carries on the little-known but great gardening tradition of the Ottomans. It is particularly significant because there are no surviving examples of this type, which was developed between the 16th and 19th centuries in what is now Turkey. It is especially fortuitous that St. Louis and Istanbul, the Imperial capital of the Ottoman Empire, lie roughly at the same 40° latitude, offering the climatic opportunity to feature many of the same plants. Visitors senses are piqued by the visually lush and peaceful setting, refreshing sound of water, earthy patina of the surrounding walls and shrub hedges, the feel of the antique brick and stone, and the myriad of plants whose primary functions are for fragrance, fruit and color. 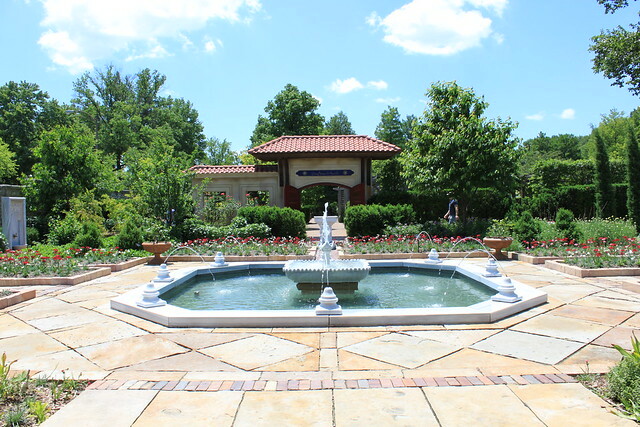 Plantings in this garden represent what would have been grown in an imperial garden during the Ottoman empire in what is present-day Turkey, consisting primarily of natives or naturalized Turkish flora. Also included are prized exotic introductions into the Ottoman Empire and St. Louis climate-tolerant plants whose appearance mimics those of non-viable Turkish types. Within the garden’s private courtyard, plantings include citrus and various hardy fruits, fragrant roses, classic Turkish tulips and drifts of bulbs, aromatic herbs, pomegranate and colorful perennials. There is an impressive architectural component as well; the entry features a double wooden door gateway within an aged stucco wall with a gabled, terracotta tile roof overhead. Iron grille windows offer enticing views of the garden within. An inscription in the Osmanli script painted in blue above the arched doorway at the south entrance honors the garden’s benefactor. A beautiful Ottoman sundial greets visitors at the garden’s southern entrance. The design is based on a sundial in Topkapi Palace, Istanbul and features two sundials superimposed on one horizontal dial plane. One dial uses a polar gnomon and shows western solar time. The other uses a vertical gnomon and shows Moslem prayer times, Italian hours and Babylonian hours. Various fountains and architectural elements fabricated in Turkey for the Ottoman Garden provide a strong sense of authenticity. A stone pedestal fountain, or cheshme, invites visitors to rinse their hands in the cooling water. A juniper allee leads the visitor to the central focal point, a shallow pool of water, the havuz. Water spouts gently from the small jets along its rim, circling the stone water bowl in the center, the Source of Life giving birth to the River of Paradise. At the rear of the garden, a paved patio covered with a wooden arbor, or chardak is planted with grapes. A textured stucco wall with tiled roof, painted murals and birdhouses are the backdrop for the patio, set off by the gentle sound of water spilling from the tiers of the fountain, or selsebil. More information and images can be found in the 64-page Bakewell Ottoman Garden book. 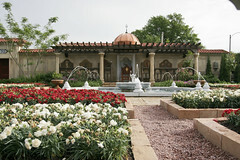 The Ottoman Garden was made possible by a gift from the late Edward L. Bakewell, Jr.